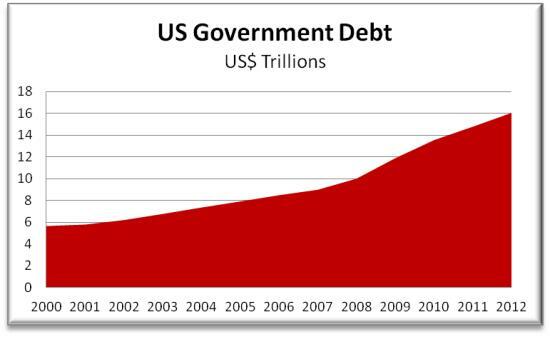 The United States federal debt was $17,231,462,073,502 at the time that I wrote this article, and at that same time the Gross Domestic Product was $16,014,925,300,905. Never before has the National Debt exceeded the GDP; not even in the free-spending years of the New Deal or Great Society. Not during World War One, nor during World War Two. Not even during the most destructive war, the civil war. Washington shows no sign of stopping spending. House Minority Leader Nancy Pelosi denies the problem of the debt, Senate Majority Leader Harry Reid and President Obama encouraged us to keep on spending and borrowing money. Something needs to be done about the self destructive ways of Washington. I propose first creating a commission to take a scrutinizing look at every federal agency, and if it is unnecessary, eliminate that agency. If the commission sees an agency that has the same purpose as another, one of those agencies should be eliminated. If a program is not so critical as to require borrowing money from China to fund it, it is not necessary. I propose secondly spurring on economic growth by taking the Federal Government out of the private sector. Every time in history that the Federal Government has attempted to solve problems by forcing it’s self into the private sector, it has failed miserably. That is the reason that so many jobs that belong in America are going overseas to India, to Malaysia, to China, to Japan. If we can get rid of the red tape that suffocates America’s workers and businesses, business will once again thrive in the United States. America will again be number one, again a superpower. In order for every American to have equal opportunity to live his or her American Dream, we must begin to pay off the national debt so that my generation and my children’s generation will not be held captive by the errors of today’s government. I say that it is an error and not a mistake because an error does not become a mistake until we refuse to fix it, and at this time we can fix our errors and keep them from becoming costly mistakes that we will regret for generations to come. Previous What is Wrong With The Budget Deal?